This genus of small, brown-spored pleurotoid mushrooms contains a multitude of boring whitish to brownish species and a few (well, two) that are more interesting. The rare Crepidotus cinnabarinus is bright red, and Crepidotus crocophyllus usually features yellow to orange gills . . . but pretty much everything else is brown or white, and requires extensive microscopic study for accurate identification. If this sounds like fun to you, I invite you to explore the wonderful world of Crepidotology. Alternatively, you can call your collection a "run-down elevator" (a decrepit Otis) and have done with it. 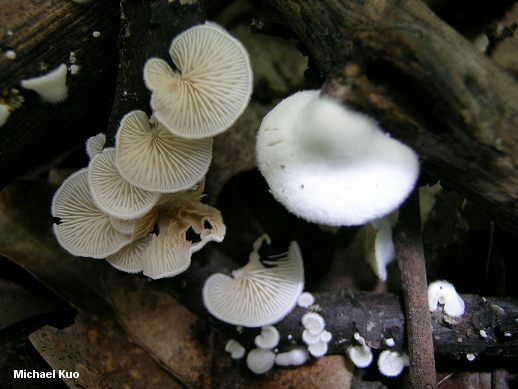 If you are bound and determined, microscopic features used to separate species in Crepidotus include the anatomy of spores, cheilocystidia, and pileipellis, as well as determining the presence or absence of clamp connections. Hesler & Smith's 1965 monograph of the genus in North America is the starting place for identification work, but Mexican researchers Victor Bandala and Leticia Montoya have made substantial contributions to North American Crepidotus research in a series of recent publications (2000a, 2000b, 2008a, 2008b)--and they have simplified the picture somewhat by widening species concepts and allowing for more variability in features. Aime, M. C. (2001). Biosystematic studies in Crepidotus and the Crepidotaceae. Doctoral dissertation, Virginia Polytechnic and State University. Aime, M. C. & J. Ball (2002). The mating system in two species of Crepidotus. Mycotaxon 81: 191–194. Aime. M. C., R. Vilgalys & O. K. Miller (2005). 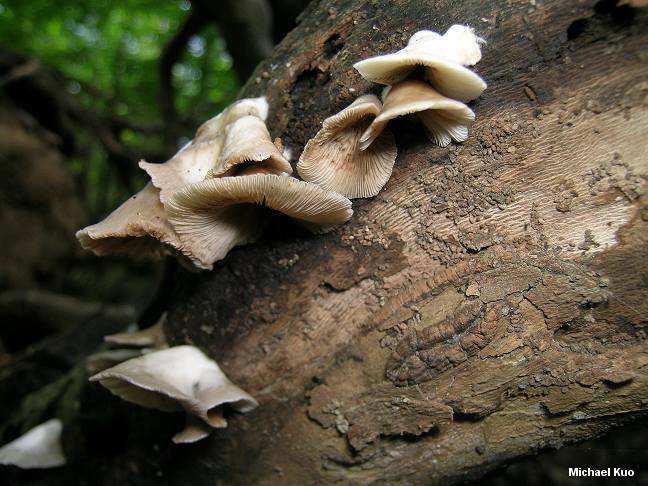 The Crepidotaceae (Basidiomycota, Agaricales): Phylogeny and taxonomy of the genera and revision of the family based on molecular evidence. American Journal of Botany 92: 74–82. Bandala, V. M. & L. Montoya (2000a). A revision of some Crepidotus species related to Mexican taxa. Mycological Research 104: 495–506. Bandala, V. M. & Montova, L. (2000b). A taxonomic revision of some American Crepidotus. Mycologia 92: 341–353. Bandala, V. M. & L. Montoya (2008a). Type studies in the genus Crepidotus. Mycotaxon 103: 235–254. Bandala, V. M., L. Montoya & M. Mata (2008b). Crepidotus crocophyllus found in Costa Rica and Mexico and revision of related species in subsection Fulvifibrillosi. Mycologia 100: 335–346. Hesler, L. R. & Smith, A. H. (1965). North American species of Crepidotus. New York: Hafner. 187 pp. Luther, B. S. & Redhead, S. A. (1981). 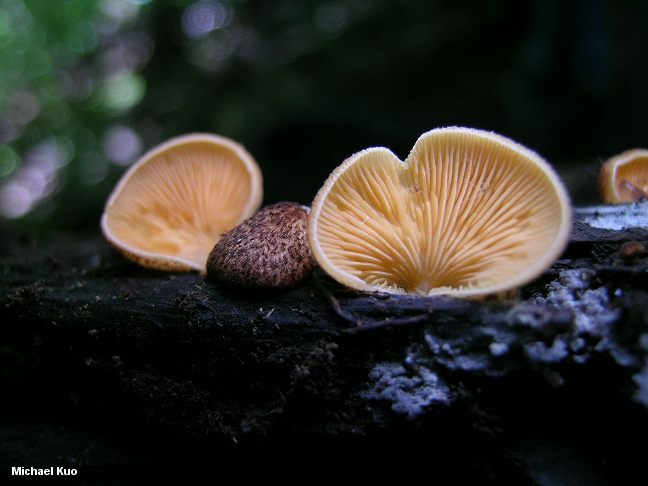 Crepidotus cinnabarinus in North America. Mycotaxon 12: 417–430.